This building, beautiful and unusual for St. Petersburg, is a silent witness to the story of the short-lived dramatic reign of Emperor Paul I, son of Catherine the Great. At the dawn of her reign Catherine overthrew her husband Peter III then ruled the country till her death in 1796. By then Paul was 42 years old and should already have ruled for 20 years or so. Neither the nobility nor the royal guards liked or respected Paul, so he was constantly afraid of assassins. He ordered a fortified palace (a castle surrounded by deep ditches) to be built for him. According to a legend, one of the soldiers guarding the construction site once had a vision of the Archangel Michael guarding the castle alongside him. 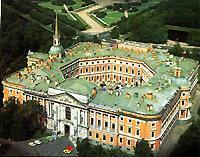 This was reported to the Emperor and the castle got the name Mikhailovsky (St Michael's). Emperor Paul did not live in his new palace for long. In 1801 he was assassinated in his own bedroom by a group of officers who organized a coup, inspired by Paul's son Alexander. Later the castle was used for the army engineers school and was called the Engineer's Castle. Nowadays it is the branch of the Russian Museum.